Simón Bolívar was a very influential Venezuelan statesman and military leader during the Latin American Wars of Independence. His birthday is annually commemorated in Venezuela, Ecuador, Colombia and Bolivia on July 24. The holiday is known as Simón Bolívar Day. 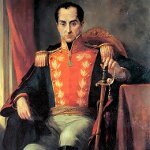 Simón Bolívar was born on July 24, 1783 in Caracas. He received European education and in 1805 he visited the USA. There he plotted the struggle of South American colonies for independence from Spain. The first country, that declared independence with his assistance, was Venezuela. In 1813 he was proclaimed by the National Congress as El Libertador (The Liberator). Bolívar also liberated New Granada (present-day Panama and Colombia), Quito (Ecuador), Peru and Bolivia. He was the 1st President of Gran Colombia (the state comprised of the territories of present-day Venezuela, Colombia, Panama and Ecuador), the 1st President of Bolivia and the 6th President of Peru. Simón Bolívar Day is a public holiday in Venezuela. Also this day is celebrated as national holiday in other countries of Latin America.